War almost always causes strife and hardship, especially when you're playing against someone who seems like they've got a million face cards. For a war refugee looking to end your stomach's hardships, check out Bun Mee, opening April 1st. 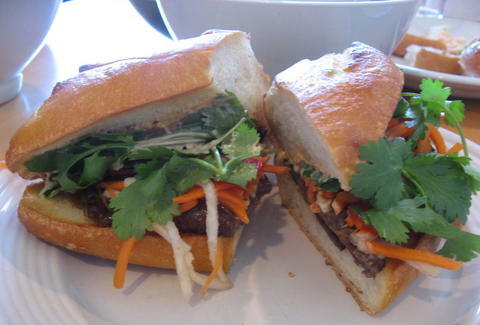 From a Vietnamese expat who fled the War and grew up in the Big Easy (where her dad worked dishing out Cajun-Creole), Mee is an alleyway-shaped 20-seat banh mi-taurant set up in an old gelato shop, with a street food-inspired interior anchored by a chandelier made out of a reclaimed bike wheel, but not a reclaimed Big Wheel, because no one is stupid enough to give one of those away. The Vietna-menu (inspired by a return trip to the motherland) will sport nine banh mi offerings, including the Sloppy Bun (curry ground pork, shaved onion, Thai basil), the Combo (housecarved roast pork, paté de Champagne, and all the fixings), and the lime pepper aioli-smothered Juicy Steak, which's topped with the works, plus lotus root relish, crispy shallots, and shaved onion, which beat the hell out of ones with a landing patch. There's also ample starter-age, like Mamma Tran's Crispy Egg Rolls (a recipe yoinked from her mom with ground pork, crab meat, wood ear mushrooms, and glass noodles), plus non-banh mi mains like a Saigon Peanut Rice Bowl (Vietnamese slaw with roasted peanuts and Bun Mee's special peanut sauce over rice), and a grilled steak/grape tomatoes/orange and grapefruit/tea egg salad called the Vietnamese Caesar -- a look popularized by Ngeorge Clooney. They've also got plans for an authentically Southeast Asian scooter delivery service in the coming weeks, and though they don't officially open until next Friday, we've got five just-for-Thrillist passes (all with a +1) to the pre-opening party this Saturday, which could be yours, depending on how you play your cards.